A photographer for more than 40 years, Marge Agin started out shooting weddings and portraits. But she really wanted to work in fine art photography. The collection of images tells the story of the historic town on the May River. It is filled with edited photos of the area’s landscape and wildlife, as well as shrimp boats, historic buildings, even a river baptism at The Church of the Cross. 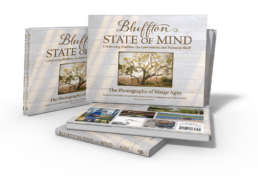 “Bluffton State of Mind,” Agin’s fourth book about the area, also features sketches by Doug Corkern and essays by former Bluffton Mayor Emmett McCracken, current Bluffton Mayor Lisa Sulka, Palmetto Bluff vice president of marketing Courtney Hampson, and Spartina Marine Education Charters owner and operator Amber Kuehn. Agin got the idea for the book while driving past well-known Bluffton Realtor Martha Crapse’s funeral procession as it was going in the opposite direction. 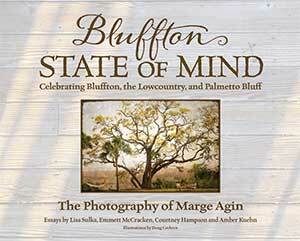 The book can be found at various stores in Bluffton, as well as online at www.starbooks.biz and www.margeaginphotography.com. The day John Gettys Smith moved his family to Hilton Head Island in 1963, he began writing in a journal to preserve the history of his new community. He and his wife, Nelle, had moved from York to the island with their three young children. John had accepted a job doing public relations for Sea Pines and called it “the chance of a lifetime.” Nelle opened the island’s first gift shop, Nell’s Harbour Shop in Harbour Town, in 1971. Years later, Nelle promised her husband that she would finish his memoirs and write her own. She kept that promise; she and the couple’s daughter, Ora Elliott Smith, have turned John’s journals into a book. 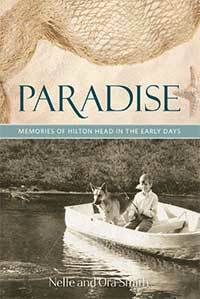 “Paradise: Memories of Hilton Head in the Early Days” includes stories about John’s job interviews with Charles Fraser, his efforts to start a school on the south end of the island, and his marketing plans for golf and tennis. Nelle said there were no banks, doctors or even a library on Hilton Head when her family arrived. Nelle said John had to think of ways to bring people to Hilton Head. For five years, he was the chairman of the first Heritage golf tournament. He was also the first chairman of the World Championship Tennis tournament on the island. In 1996, Nelle and John moved to Beaufort. John died in 2009. Nelle works part-time at Lulu Burgess in Beaufort, while her daughter owns an errand service company called Beck and Call. The book can be found at several area stores, including By Hand, Ink; Grayco; Pretty Papers & Gifts; The Greenery; the Shop at the Top at the Harbour Town Lighthouse; Nell’s Harbour Shop and J. Banks Design. 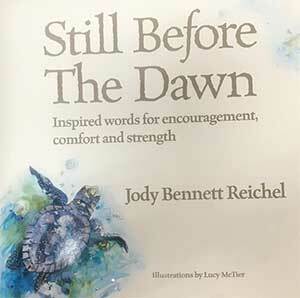 Jody Bennett Reichel’s book “Still Before the Dawn” was meant to comfort others. But the author said it has brought a tremendous amount of peace to her own life, especially after seeing how it affected others. The longtime Hilton Head Island resident began writing poetry several years ago and released the book of inspirational poems in 2016. Since then, thousands of copies have sold, and stores have had to reorder again and again. The poems have helped many people through some of the most trying times of their lives, Reichel said: She receives an email or text four or five times a week from a reader inspired by her work. When her sister was diagnosed with ovarian cancer in 2017, Reichel gave her a copy of the book and her sister brought it to infusion treatments. She ended up sharing it with other patients, and today the book can be found in several cancer centers for patients to read during treatments. The book includes Bible verses, art and poetry related to various topics, from adversity to friendship, marriage and worship. Reichel’s words are complemented by the watercolor illustrations of Georgia artist Lucy McTier. McTier was inspired by items around Reichel’s house that are dear to her. McTier’s work can be seen in several galleries and is in more than 350 public and private collections. The book can be found at most local gift shops in Bluffton and Hilton Head and online at www.jodyreichel.com and www.starbooks.biz. For more illustrations by McTier, go to www.mctierart.com. See original article at HiltonHeadMonthly.com. Welcome to Bluffton, Palmetto Bluff and the Lowcountry – concert row seating to the best show on earth! Spartina grass, pluff mud, cast nets, no-see-ums, dolphin, shrimp, ’gators, and loggerheads. Sippin’ on the sand bar and evening marsh glow. A thousand different sunsets and a million more sunrises. Here, water and sky meet to make a masterpiece. © 2018 | Marge Agin Photography All rights reserved.